First things first: check out my guest post called “I Run For Me” over at Live Love and Run. I’ve been on a roll lately! I love love love chili. It may seem weird to be making chili in the summertime but here in Oregon it’s been mild weather and the Sunday afternoon I decided to make this recipe was overcast and drizzly. I had almost all of the ingredients except for the chipotle powder. Do you know how hard that is to find?! Michael tried to find it and failed and I also failed. I found a “chipotle salsa” that I decided to substitute. It was the best I could do. I started cooking, chopping and measuring and Michael joined me in the kitchen to help. It was nice to cook together. It’s been awhile since we’d done that. We both looked at the ingredients list and balked at the “2 Tablespoons of chili powder” and I quickly checked the reviews of the recipe online. That’s a lot…right? But everyone said it was good so we decided to go for it. 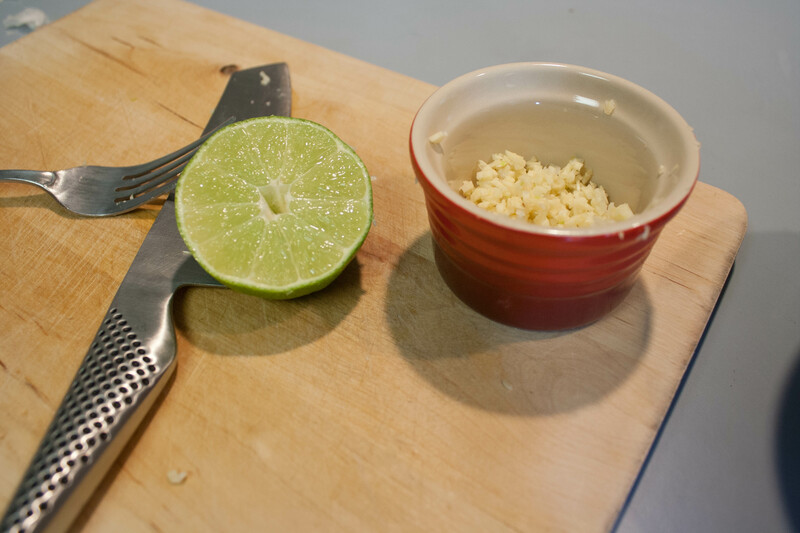 Add garlic, chili powder, cumin, chipotle and salt and cook, stirring constantly, for 30 seconds. 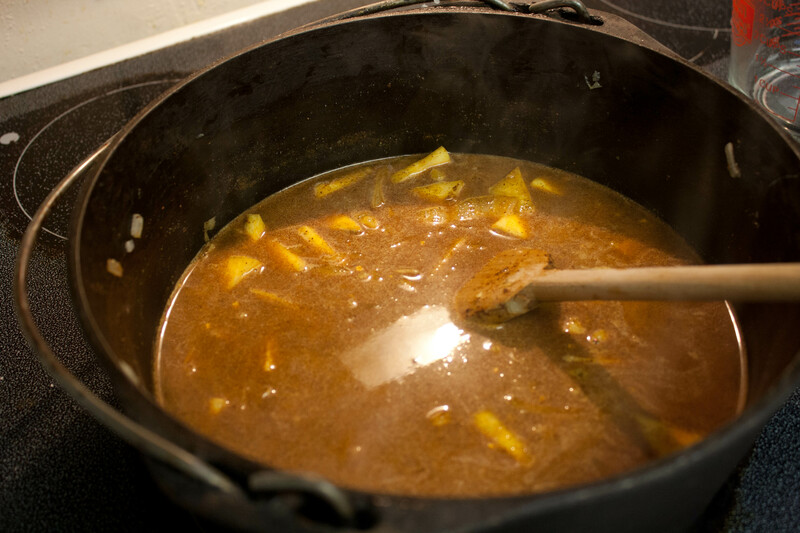 Add water and bring to a simmer. 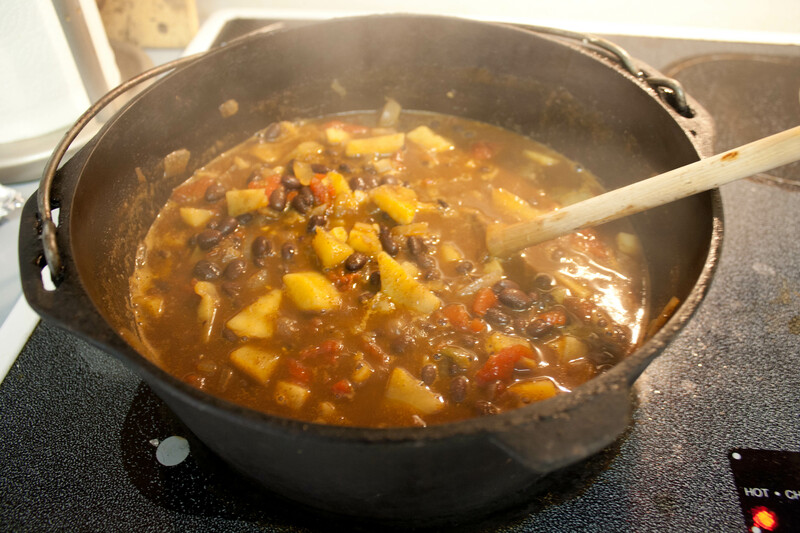 Cover, reduce heat to maintain a gentle simmer and cook until the sweet potato is tender, 10 to 12 minutes. I think I added a bit too much sweet potato. I used a large one instead of medium sized. I love using my Dutch Oven and sadly, not many recipes I make need it. It’s always a treat when I pull it out. Once everything was in the Dutch oven simmering, I tasted it here and there to see how spicy it was and if I should add more chipotle salsa. I ended up adding a little bit more. Despite having 2 Tablespoons of chili powder and very spicy chipotle sauce, it wasn’t that spicy. 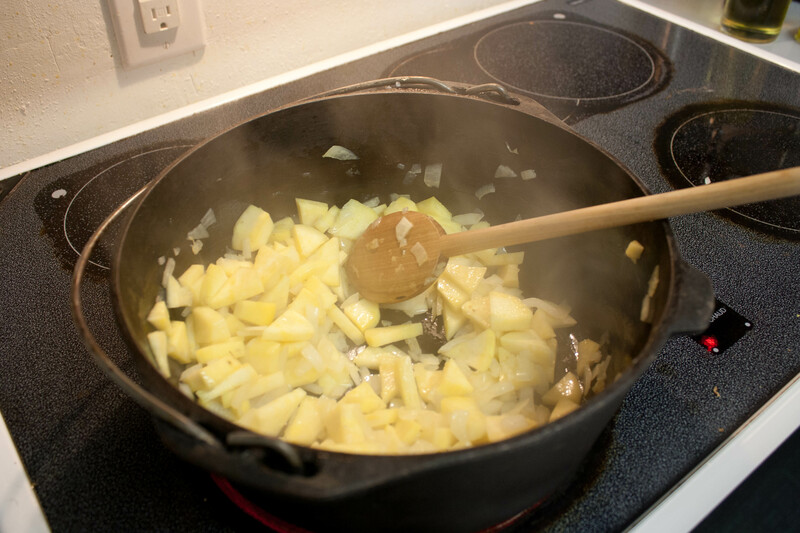 Is there any better smell than the aroma of onions and garlic cooking in a skillet? I let it simmer for a little bit longer than the recipe suggested because there was a lot of liquid. I wanted it to cook down just a little bit. While I was waiting for it to simmer down, I watched a little bit of “Drop Dead Diva” (any other fans out there? I’m on season 2). I wished that I had made some cornbread to go along with the chili because it would have been a perfect combination. The end result wasn’t as soupy as the above photo. I put a little big of shredded Colby Jack cheese on top and a dollop of sour cream. We ate the chili with some tortilla chips (again, I would have preferred cornbread to chips). The chili was pretty good. It wasn’t the best chili I’ve ever made and it wasn’t spicy at all (at least to me). I think it was more smoky than spicy. I most definitely have to go to a specialty store to get that powdered chipotle peppers because I’m sure it makes a big difference. I think it would also be good with some ground turkey meat. QUESTION: Do you like your chili spicy, smoky or savory? What an interesting recipe! 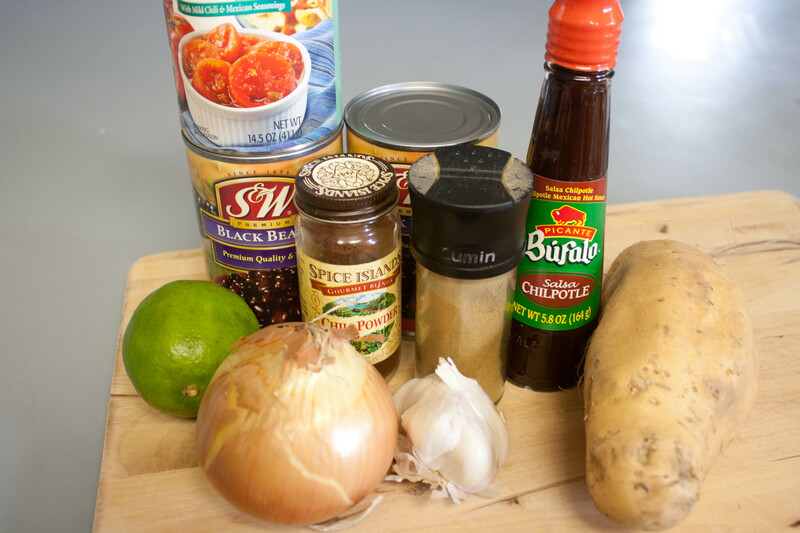 I’ve never seen a chili recipe that contained sweet potato. Sounds wonderful, I’m going to have to try that (even if I don’t follow the rest of the recipe). It wasn’t sweet at all, either. It was an interesting chili and I liked it–just wish it had had more chipotle flavor. Ooh, this recipe looks good! 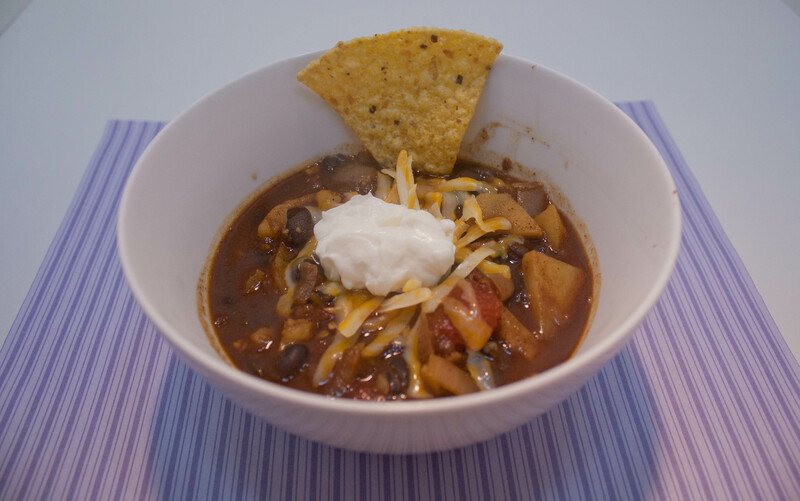 I’m a huge fan of chili, too, even more so after I bought my first slow cooker years ago. I love adding chipotles in adobo sauce to my chili. The smoky flavor they add is just amazing and it adds just enough of a spicy kick without being overwhelming. Where do you find chipotles? I couldn’t find it anywhere! I love chili in a slow cooker. 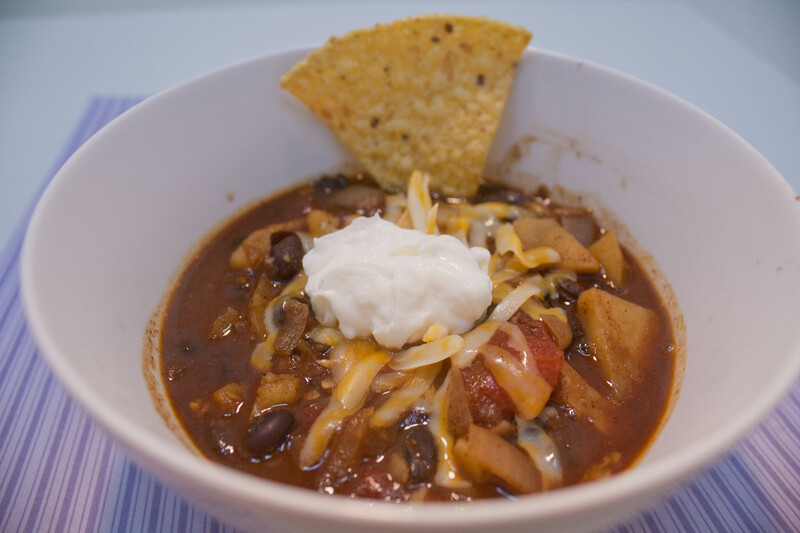 I’ve been on the search for the best slow cooker chili recipe for awhile now. Penzey’s spices (see website for mail order and locations list) sells excellent chipotle powder – not very hot, but it has a lovely rich smokiness. I use it in lots of ways, including in scrambled eggs with salsa, on roasted sweet potato, with any kind of barbecue, etc. Thank you for the tip! I will check it out. There’s actually a store near my office. I didn’t even think to try there. Looks amazing! I am a chili fan, although we only do vegetarian or sometimes chicken. I like savory sweet potatoes so I bet I would like this! I’ve never tried chili with chicken in it. Interesting idea!